aspartic acid is an amino acid used to enhance skin smoothness. It is usually present in products for dry skin. 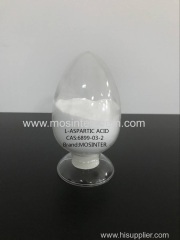 Aspartic acid is a nonessential amino acid naturally occurring in animals, plants, sugarcane, sugar beets, and molasses. Aspartic Acid is a nonessential amino acid that exists as colorless or white crystals of acid taste. It is slightly soluble in water. It functions to improve the biological quality of a total protein in a food containing naturally occurring primarily intact protein and as a nutrient and dietary supplement.